From a company in Maryland called Hop Candy Inc. comes a beer-related chocolatey treat: Hopolates. Basically, take your pick of dark or milk chocolate and combine it with one of four varieties of hops: Nugget, Northern Brewer, Cascade, or Amarillo. From the website, a dozen cost about $11.99 shipped (within the US - shipping to Canada is significantly and stupidly more expensive), or around $7 if you see them at a festival. First is dark chocolate with Northern Brewer. Smell-wise, what mostly comes to mind is just a dark chocolate Easter bunny. After a big bite off the top of the "mug", I was fairly impressed. This little chocolate really does pop with hops. There's a bit of bitterness, and the flavours (and some aromas) of the hop variety really pop out (and linger) when eaten. Tasty. Next up is milk chocolate with Cascade. Smell is the same in that there's no hops - just milk chocolate. Bitterness seems to be up on this one and flavour down compared to the first - I expected this one to be a bit stronger in flavour for some reason (like after one, I'd be some kind of Hopoplate expert). After my second and then final bites, the pithy flavour comes through more. Bit of citrus, but mostly a bitter / pith note with the chocolate. Nice, but I like the first one better. Third is dark chocolate with Amarillo. The chocolate's just as nice and flavourful and bitter as the first one. You can get some of the hop notes that you find in the milk chocolate version of this (mostly a bit of the grapefruit), but they're more masked by the stronger chocolate. Finally (sniff!) we have milk chocolate with Amarillo. There might be a whiff of hops from this one. Maybe. Starts off a bit more subtle than the Cascade, and less bitter. This one has a bit of citrus, grass, and pine to it. The bitterness built up a bit by the end of this one. My verdict: I liked the dark chocolate ones most, as they seemed the best match for the hops (incidentally, this is a cool way to learn about a few hops' characteristics separate from any others). They were all tasty (man) chocolates, but my favourite, the one that gave the strongest hop impression, the one that married hop with ocolate the best... was the first one. If you live in the States, this is a treat well-worth ordering. If you live in Canada, it might make a treat or surprise for a special occasion. 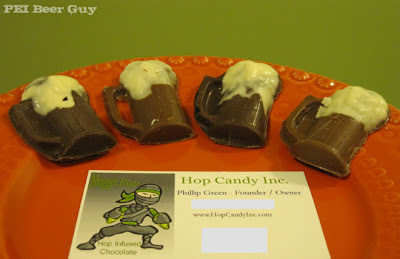 I've had chile's and chocolates but never really thought of mixing hops and chocolates ... interesting treat.